Traveling to some of the neediest areas of the world, the Moran Eye Center Outreach team based in Salt Lake City, Utah, conducts nine major outreach medical eye camps each year. Most recently, they have established vital local partnerships and made five-year commitments to Haiti, Micronesia, and Guatemala. 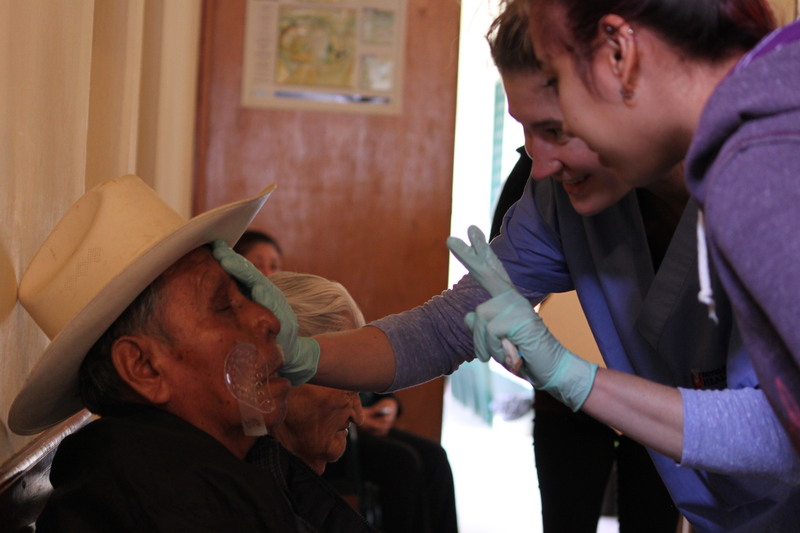 In November, 2014, the team conducted its second outreach medical eye camp in Salamá, Guatemala—a region with 700,000 people and only one ophthalmologist. Here’s a day by day account of that experience. Before the driver can turn off the engine, the team is off the bus and unloading medical supplies. A single-file line forms, and each person steps forward to receive an equipment bag. As the final duffels are carried in, the operating room team begins tearing down the existing clinic. They move tables, clear shelves, and relocate equipment. They want a clean canvas for their surgical supplies, operating tables, and microscopes. Before the week’s end, they will restore sight to more than 100 patients—a feat made possible by Moran’s many dedicated professionals who have spent years creating and refining best practices for delivering care to remote and underserved regions. The support of dozens of volunteers and hundreds of donors have made this mission, and others like it, possible. Shuffling backwards, Lucia Pasqual glances over her shoulder as she leads her mother by both hands into the clinic. 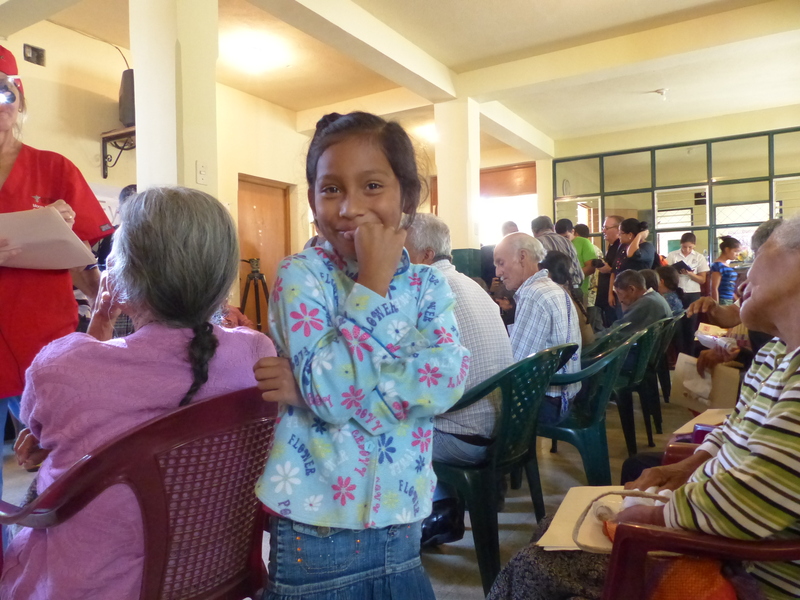 Local Lions Clubs have spread the word that Moran’s surgeons are in Salamá, and Lucia has brought her mom, blind in both eyes, for help. Like most of the patients, her mother has cataracts from years of working in the fields under the intense sun. Her family worries that her mom will fall or hurt herself, so Lucia has quit work to care for her. The family has now lost two incomes. All morning, patients stream in. Most have blinding cataracts in both eyes. They are courageous and trusting as their families navigate the organized chaos, leading them from check-in to scans and measurements, to registration and lens selection, to dilation, blocks, and surgery. The team completes 34 surgeries. Still wearing his post-surgical eye shield, Santiago is carefully guided by his daughter to a seat in the waiting room. His head hangs and his expression is blank. Santiago has been completely blind for years; by now, he is used to a world without sight. As the medical team works its way down the line of post-operative patients, Santiago waits patiently to have his patch removed. At last, he is instructed to lift his head. A volunteer gently pulls the tape from his brow and his eye patch falls. Santiago stares vacantly for a minute before blinking and moving his eye. Slowly, he turns toward his daughter and grins . She laughs and smiles back. Santiago can see! When asked what they are looking forward to now that his vision is restored, they both say freedom. The family is free from the burden of having to care for him and Santiago is free to return to work. Today, the team restores sight to 37 patients. Patients and their families are crammed in the clinic. Busloads have arrived from Coban, a rural village eight hours away. Others traveled by cart and oxen. Marta Morente Ixcopal used her family’s savings to hire a taxi to bring her mother, Cornelia, for surgery. Cornelia is deaf and blind and must be carried everywhere. Marta does not know where they will stay for the night, but she trusts there will be help. She is right. The local Lions Club has arranged for patients who have traveled far distances to stay in the locker room of a nearby soccer stadium, where they will be fed and given bedding. The team completes 35 surgeries. Today there are tears. Cornelia’s daughter, Marta, waits anxiously for Cornelia’s patch to be removed. Yesterday, the doctors told her there is nothing they can do for her mother’s right eye– the damage is permanent; but they operated on the left eye hoping to restore partial vision. When the patch comes off, Cornelia struggles to open her eye. She is stoic, and it is unclear if the surgery has worked. Marta asks if she can see, and Cornelia nods. She can perceive light. The doctor comes. He tells them the surgery was successful and she should gradually start to see more. They wait quietly for the taxi that will take them home. When it arrives, Marta prepares to lead her mom out of clinic, but Cornelia waves her off. She wants to walk on her own. Mother and daughter both start crying. Cornelia is seeing! They hug each other and the Moran staff. Then, side by side and hand in hand, they walk to their taxi. “Thank you, thank you,” they say the entire way. Download a copy of Changing Lives, Transforming Communities.